Improvements to the nation’s air traffic control system, including a shift to more efficient GPS-based routing and GPS-enabled aircraft surveillance, are largely on track and within budget, according to a recent watchdog report from the Government Accountability Office (GAO). The GAO evaluated the NextGen program under which the Federal Aviation Administration (FAA) is implementing more than a dozen interrelated upgrades including improved communications, automated reporting of aircraft positions using GPS-based technology and Performance-Based Navigation (PBN), which uses GPS to enable shorter, more direct flights. The NextGen program will make it possible for the air traffic control system to handle more planes while reducing delays, emissions and operating costs. The FAA has revamped the program several times to address cost and schedule problems and to better integrate the priorities of stakeholders. The agency estimated in 2007 that the cost of the system-wide remodeling would run between $29 and $42 billion by 2025. Though a variety of changes have been made, acknowledged GAO, the program is, for the most part, meeting its goals, the auditors said. 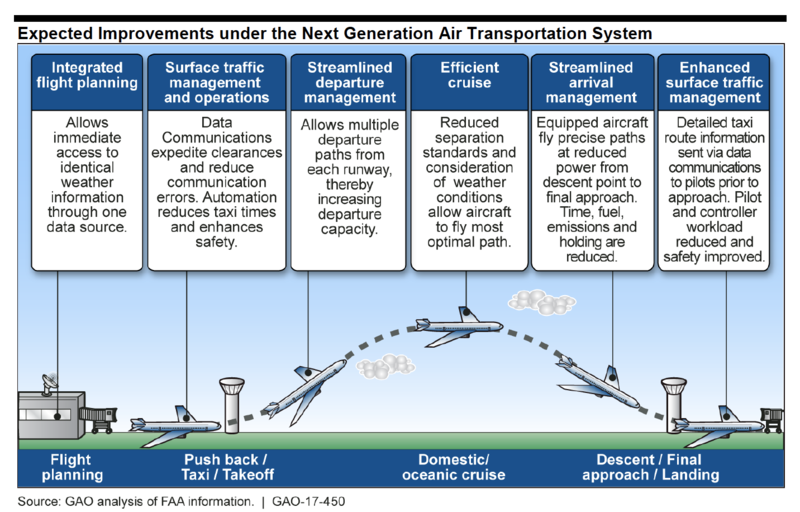 "While specific NextGen initiatives and programs have changed over time," the GAO wrote in its report Progress and Challenges in Implementing NextGen, "FAA’s 2016 cost estimates for implementing NextGen through 2030 for 1) FAA and 2) industry — $20.6 and $15.1 billion, respectively — are both within range of 2007 cost estimates." Among the most significant changes was one made at the suggestion of NextGen stakeholders: the refocusing of NextGen’s initial airspace redesign and PBN development on metroplexes, that is metro areas with more than one airport. “Metroplexes have a large effect on the overall efficiency of the NAS, because congestion or delays at one metroplex can affect NAS operations in other parts of the country," wrote GAO, in reference to the National Airspace System (NAS). The PBN work plan was altered after a 2011 program review to set a goal of completing 10 metroplexes by 2016 — that is establishing procedures and training all air traffic controllers in the selected metro areas. As of August 2017 work on only four metroplexes had been finished, in part because of the implementation of enhanced community involvement and outreach activities. Noise problems caused by the new flight procedures have generated numerous public complaints and the necessary outreach has created delays of half a year or more. The FAA even “paused” work at the Phoenix metroplex in October 2015 after the City of Phoenix took legal action over the noise created by new PBN procedures. Though community resistance has been an issue, both FAA officials and nearly two dozen of the 34 stakeholders interviewed by GAO cited Congress’s inability to smoothly fund and manage the agency as a significant factor in NextGen problems. In fact, congressional bottlenecks were cited by stakeholders as a primary reason for getting air traffic control out from under the FAA and Congress and putting it in the hands of a nonprofit that could budget and borrow like a commercial operation. "Uncertain funding includes not knowing the amount of funding that will be appropriated to NextGen or when the funding will become available," wrote GAO. "From fiscal year 2011 through fiscal year 2016, Congress has passed 25 continuing resolutions that impacted funding for FAA, ranging from 1 day to 365 days, with an average of approximately 46 days." The stops and starts associated with continuing resolutions make it difficult for FAA to carry out long-term planning and strategic development of future technologies, stakeholders told GAO as part of a 2014 study. Though aviation officials have adopted incremental goals to better be able to deal with the uncertainty — a strategy with which the GAO seemed to largely agree — the report reiterated that "continuing resolutions can also complicate agency operations and cause inefficiencies, such as leading to repetitive work, limiting agencies’ decision-making options, and making trade-offs more difficult." As it happened, the GAO report, dated August 31, was released September 7 — just weeks before the federal government was set to begin operation under yet another continuing resolution or CR. The GAO loosed its findings at an awkward time for those pushing to take air traffic control out of the hands of the FAA. Though FAA’s budget is, at least temporarily, taken care of by the new CR the agency must be reauthorized by the end of September. That reauthorization is reportedly expected to stall due to Senate opposition to privatization. Rep. Bill Shuster, R-Pennsylvania, the chairman of the House Transportation Committee and a major proponent for privatization, was clear about his view of the GAO’s conclusions. "Don’t be fooled by reports of recent ‘successes’ in the FAA’s delayed NextGen modernization effort," Shuster said in a statement. "These overblown, incremental and piecemeal improvements disguise the fact that the FAA has continually moved the goalposts and dumbed down NextGen in order to enhance the optics of its performance." Shuster pointed to an earlier report by the inspector general (IG) of the Department of Transportation (DoT) that said aviation officials had overestimated the benefits of NextGen. "The inspector general’s review reinforces what has become more and more obvious with every new study and report that comes out — the government’s continued promises and claims about NextGen benefits are not based in reality, but on a lot of smoke and mirrors,” said Shuster in a statement. The IG said the FAA’s estimation of benefits to be accrued by 2030 did not take into account its experience with delays and did not adequately convey the complexities it is facing. The FAA told the IG, after reviewing its results, that it took a conservative approach for calculating benefits by not including all capabilities in the business case that the agency expects will provide benefits but have yet to be quantified. GAO noted in its results that most of the system updates needed to transform the NAS into NextGen will be in place by 2025. "Today’s (GAO) report confirms that light is at the end of the NextGen tunnel," said Rep. Peter DeFazio, D-Oregon. "The GAO validated the fact that NextGen is within the cost range that the FAA predicted in 2007, refuting claims by FAA critics that NextGen is somehow over budget. Moreover, the GAO found that the controversial proposal by congressional Republicans and the Trump administration to privatize the air traffic control system and hand it over to special interests is, itself, a major challenge to continued NextGen implementation. Authorization of the FAA expires at the end of September. If Republicans in Congress and the Trump administration are serious about improving the air traffic control system, they should abandon their risky privatization proposal and get to work to pass a bill that will provide a stable and predictable funding stream for our aviation system."